A five-year-old boy with a serious blood disease is expected to receive an umbilical cord blood transplant today, setting a record of 200 cord blood transplants — an increase of 47 percent — in the city this year. The patient, surnamed Zhang from Jiangxi Province, had a fever of unknown origin in September. After a 10-day treatment with antibiotics was ineffective, the local hospital found he had acute and severe aplastic anemia. The disorder is a result of a patient’s bone marrow not making enough new blood cells. The boy was transferred to Shanghai Children’s Medical Center on October 11 for treatment. Doctors helped him find a matched donor from the China Bone Marrow Bank. “However, the donor refused to get an additional health check, which is a must for a transplant,” said Zhang Jiaqin, an official at Shanghai Cord Blood Bank. He said a donor’s privacy is protected. The boy was transferred to Shanghai No. 1 People’s Hospital for treatment in November. Failing to find a matched donor from the bone marrow bank, the patient’s family turned to Shanghai Cord Blood Bank and found a matched sample in mid-December. Umbilical cord blood, collected during a baby’s delivery, and donated bone marrow are both used for blood and immunity disease treatment. The key factor is stem cells, which develop into other types of cells. Stem cells from umbilical cord blood are less mature than those from adult bone marrow, less prone to rejection and more active in developing into other cells. 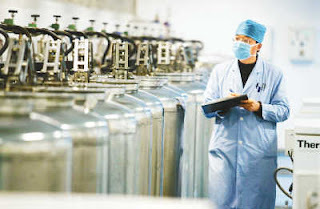 Shanghai Cord Blood Bank has collected over 20,000 samples and has fulfilled over 600 transplants since being established in 2004, making it a key supplementary service.